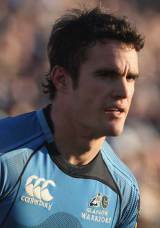 Thom Evans made his international debut against Argentina in the first of their two summer Tests in 2008 before winning further caps against New Zealand and South Africa in November that year. He missed the Test against Canada at Pittodrie with injury, missing out on playing alongside his brother Max, who made his debut that day. He returned to the international fray for the 2009 Six Nations and notched his first Test try against France at the Stade de France - a game which saw him play alongside his brother for the first time. He officially retired from the sport in November 2010 after learning that he would not be able to return to the mobility required to play at the highest level. A former member of pop band Twen2y4Se7en, Evans joined Glasgow from London Wasps in 2006 after two years with the Premiership side. He made his debut for the Warriors against Newport Gwent Dragons in 2006 and international recognition was quick to follow as he was selected for Scotland 'A' for the tie against Australia 'A' at McDiarmid Park in Perth. Evans also represented Scotland 'A' at the 2007 Churchill Cup as well as turning out for the Sevens team. During his time with Wasps Evans represented England at U21 level, scoring two tries against Scotland during the U21 Six Nations in 2006, having made his Premiership debut against Worcester in April 2005.